You are here: Home / Mark's Farm Tips / Hay! Lucerne Up! The carrying capacity of your farm is likely to change with the seasons as well as the age and condition of your stock. It is likely that a supplementary feeding regime will be required. In many parts of Australia, there are regular autumn feed gaps. Even areas coming off a good season will notice shortfalls of high quality feed. This will be even more pronounced once the first frosts hit. Joining (and subsequently lambing/calving) and turning off your stock at the right opportunity are also good justifications to supplementary feed at certain times of the year. Ideally you are looking for a supplement that has a high nutrient density, minimum management inputs and low wastage. As a good, all-round feed supplement, high quality lucerne hay fulfils this requirement admirably. At its best it rivals grain based, manufactured rations in terms of protein and energy per kg. Likewise, it is also has a good balance of essential vitamins and minerals. It is highly digestible to ruminants and high in fibre. Compared to manufactured meals and pellets it is also very practical – as there is no risk of grain poisoning. If there is an abundance of dry grass, you should not encounter problems with bloat either. However, unlike bags of cereal based supplements, there is no tag on a bale of lucerne hay to tell you the amount of protein or energy contained within. Furthermore, it is a probably not a reasonable expectation for the layman to know what quality indicators you should be looking for. An experienced person will look, feel and smell the bale. Lucerne hay bales at Aorangi, Fern Hill, Victoria. Its age and how it has been stored have a major bearing on the quality. For instance, the maturity of the plant when it was cut or whether it rained while it was drying. Even if it was a sunny or cloudy day when it was cut will affect its nutritional value! To make lucerne hay just right is no mean feat. If lucerne hay is made too dry, it is likely that a lot of the leaf material has shattered during baling and handling. Most of the energy and protein is located in the leaf, so the nutritional value of the bale will be reduced. If lucerne hay is made too moist it is apt to go mouldy and become degraded by microbial action causing hot temperatures. In severe cases it can cause spontaneous combustion. The lucerne farmer may only have a very narrow window in a day where conditions are suitable for baling. As a result, high quality lucerne hay is not always easy to obtain. Or if it is, it may not be convenient for you or an experienced person to inspect it. There are instances of a small element in the hay supply business that has preyed on the situation and novice farmers, or people looking for small quantities have been targeted. Fortunately, national standards and grading do exist and were developed by the industry peak body: the Australian Fodder Industry Association (AFIA). There are also specialist lucerne producers who guarantee their product. 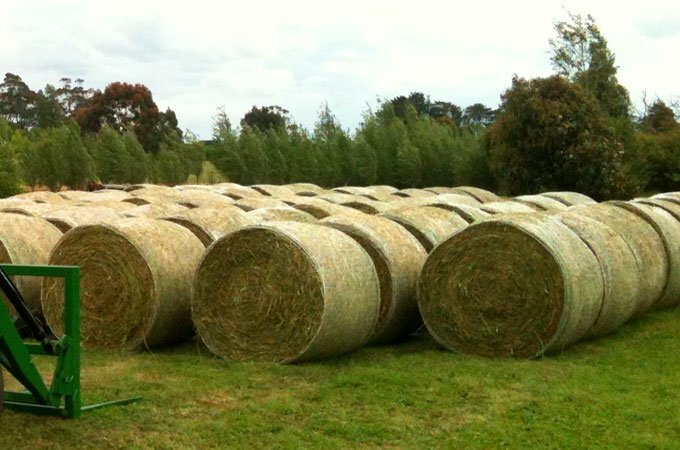 It is important to buy lucerne hay in the right sized bale to suit your farm and equipment. Small squares can be easily handled and fed out to cater for a small number of animals. They are a more expensive way to buy hay and can be laborious if they’re required to be fed out in any volume. In my game, the tractor industry, the most common enquiry is for a machine that has large bale capabilities. A big round or a big square bale of lucerne hay is going to weigh upwards of 450kg, so a substantially sized tractor and front end loader are required to handle these. 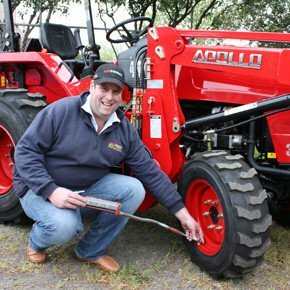 In our line up, the heavily built APOLLO 5504 50HP tractor is a perennial favourite for this duty. Large square bales are increasingly popular with large scale haymakers, because the shape is more efficiently transported. To take advantage of buying hay in bulk, you need to weigh up the costs of storage. Shedding is best, but unless you have existing facilities it is very expensive. Hay stored outside will deteriorate quickly in an east coast environment. It would be preferable to cover it with a well fastened tarpaulin unless you are in a lower rainfall environment. Spoilage and wastage can readily occur when feeding out. It is a good idea to spread out or rotate your feeding locations. This reduces bullying behaviour and also prevents localised degradation and concentration of nutrients. It also gives you an opportunity to examine what you are feeding out. It is not unheard of for bits of wire, twine and other objects that could cause damage if ingested to find their way into imported hay.